I was pleased to see that around 1/3rd of the site readers are not from the United States. You have truly a global audience. As an American, what do you think is the biggest misconception non-U.S. people have about your country? I think that those who haven’t been to the United States, and traveled through it, vastly underestimate the size, scope, and economic power of the American Empire. We are a collection of 50 sovereign states, rich in natural resources, with one of the best educated populations on the planet. Each of these 50 states is ruled by a system of checks and balances, with representatives chosen from free elections. The economy of each state is a powerhouse in and of itself. The big advantage of this is that it makes it possible for innovations in one state that improve life for citizens to roll out to others. When something novel like limited liability companies come along, the states can work together to adopt it into each of their own laws. When a perfect solution such as the Uniform Gift to Minors model is developed, it can be copied and rubber-stamped in the other states for maximum efficiency. 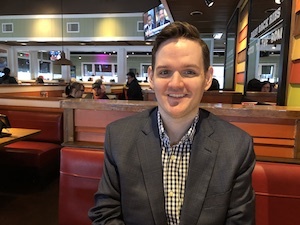 You can also “state shop” for certain solutions to your legal planning needs, as the laws of every state are different. There is a fantastic piece in The Economist from a couple of years ago called If They Were Countries that underscores this point beautifully. It illustrates how big the economy of each of the 50 United States is and compares it to other nations in the world. Each of these “countries” (states) cedes a portion of its sovereignty to the Federal Government under the United States Constitution, which guarantees certain individual rights and freedoms to all citizens. If the Federal Government ever gets too out of control, the founders put in an emergency fail safe that allows 75% of the States to call for a new Constitutional Convention, which would re-write the entire Federal Government system. In more than 200 years, it’s never been used, but it still sits there under the “Break In Case of Emergency” glass. [mainbodyad]It is this system of shared sovereignty – made possible by the fact that a significant majority of the 300+ million people living in these 50 states largely share the same language, culture, and socioeconomic values (e.g., you very rarely have ethnic strife, car bombings, and mob murders among various tribes because everyone thinks of themselves as “American” with a capital “A”, whether you are rich or poor, religious or atheist, black or white; conditions that are not possible in some other areas of the world, where neighbor kills neighbor because they happen to be of the wrong bloodline or a slightly different religion), you get a sort of exponential effect where the outcome is much greater than the sum of the parts. It’s why the single, shared currency we use as a country has the words “E pluribus unum” engraved on it, which means “Out of many, one”. Part of this prosperity is the result of our geography. This country is enormous. And it’s not just big, it’s practically all valuable real estate. The breadbasket has some of the most fertile farmland on the planet. There are immensely large aggregations of assets including coal, natural gas, oil, gold, silver, iron, timber, limestone, and salt. 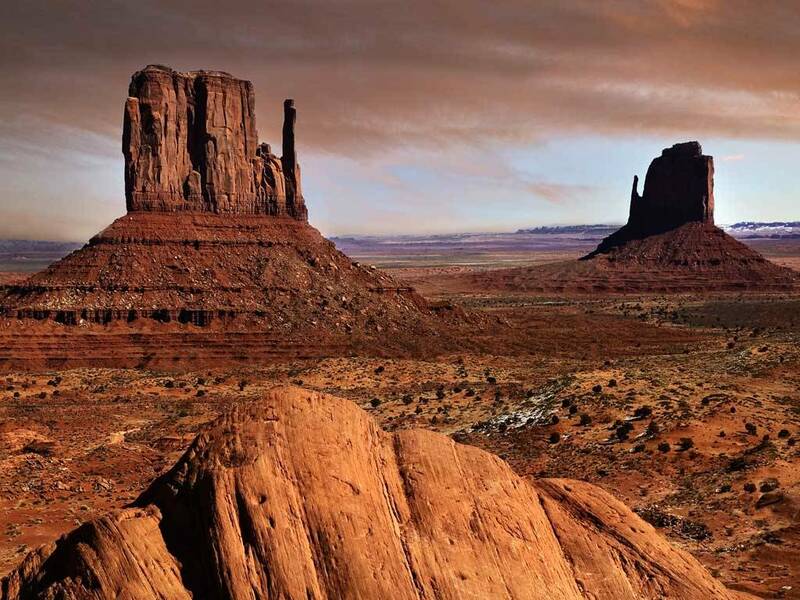 There are a wide range of climates ranging from the desert sands of the Southwest, the warm waters of Coastal Southern California, and the swamps of Louisiana to the tundra of Alaska, the rolling hills of upstate New York, and the wide-open plains of Kansas. The fact that land invasion is impossible from two sides as we are bordered by the Atlantic and Pacific Oceans makes defense easier. When I went to visit my grandmother this Sunday, that tiny journey you see on the map represented a 262 mile (422 kilometer) round trip. It barely covered part of my home state, Missouri, which by itself has a GDP equivalent to the entire nation of Finland. See Texas, a few states down from mine? To give you an idea of the size comparison, here is it over a map of Europe. 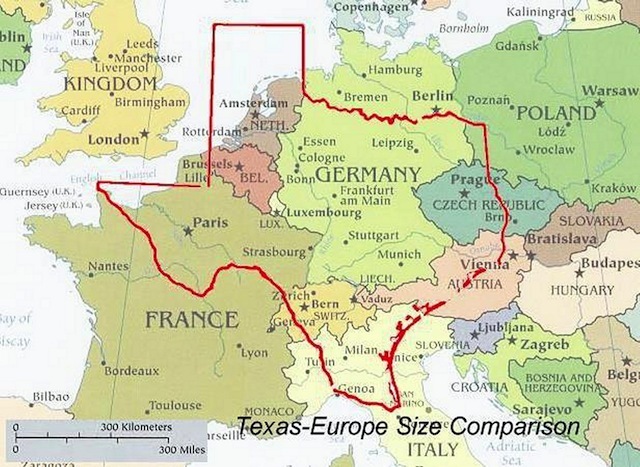 Texas, by itself, is larger than Germany, part of France, and a handful of other countries. It’s annual economic output is larger than that generated by the entire Russian empire. A one-way trip from London to Paris is 284 miles (457 kilometers). A one-way trip from New York to Los Angeles is 2,790 miles (4,490 kilometers). 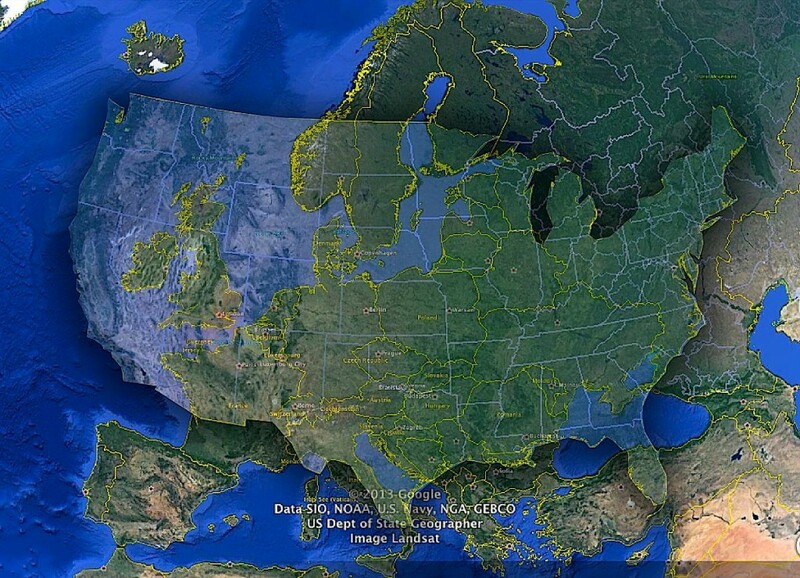 Let’s superimpose the Continental (lower 48 out of 50) states of the United States onto a map of Europe and the Middle East. 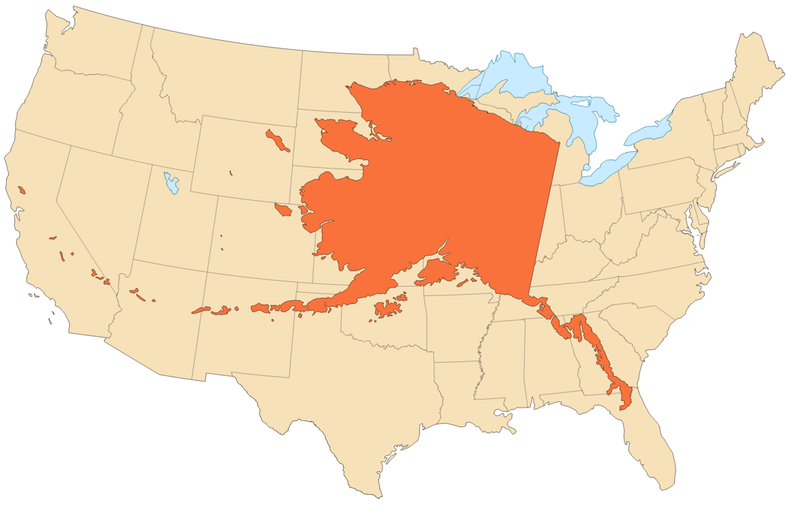 Alaska, which the largest of the 50 states by geographic area and filled with oil and other natural resources, is almost as big as the middle of the country! Alaska alone is bigger than Germany, France, Austria, Poland, etc. combined. 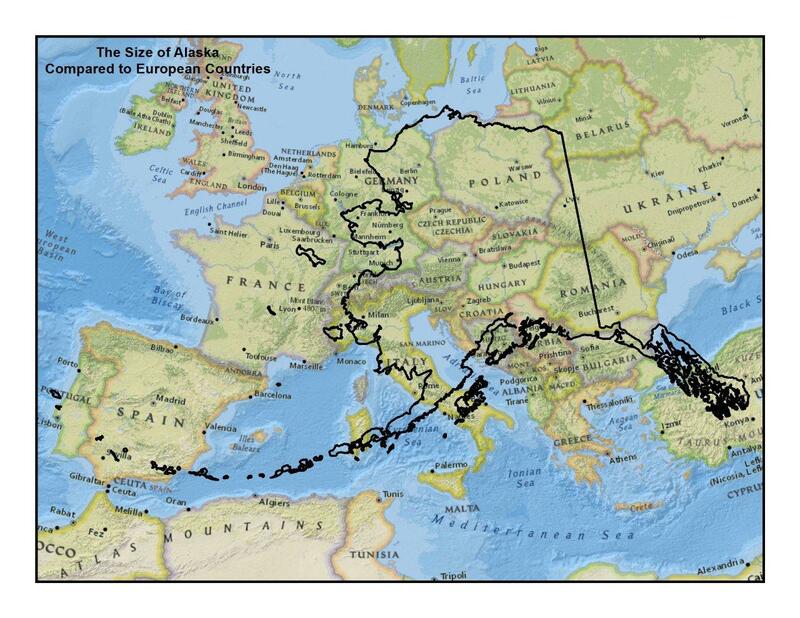 To compare Alaska by itself to Europe, look at this map. It follows that our cities are this way, too. The population of the metro area of our minor cities rival the major European ones. In my home state, the metro area outside of St. Louis is larger than Rome, Italy. The population of Minneapolis-St. Paul up in Minnesota is akin to Berlin, Germany. In Washington, the population of the Seattle area is around that of Madrid, Spain. 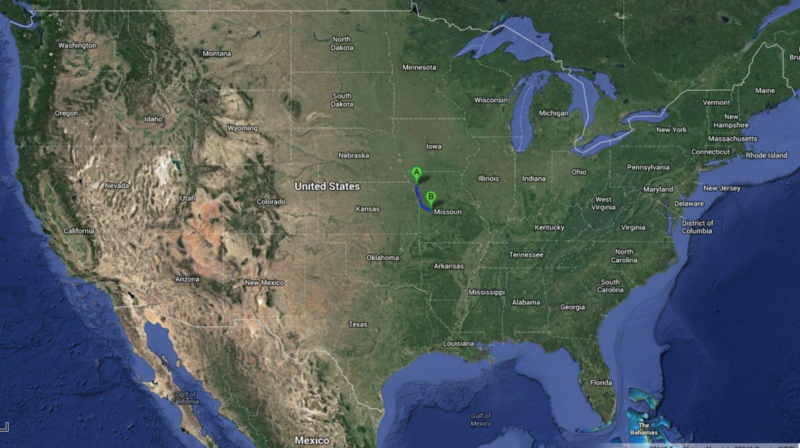 Right here in Kansas City, we are the size of Zurich, Switzerland. Houston, Texas has a population as large as Paris, France. Indianapolis, Indiana has a population around the same size as Stockholm, Sweden. This partially explains what is perceived as American arrogance. It’s not that we don’t take the demands of other nations seriously, it’s that we tend to calibrate them to our own life experience. Politically, seeing the entire nation of Spain angry isn’t nearly as bad as seeing our one state of California upset as the latter dwarfs the economy of the former. Ticking off Iran, with only $514 billion of economic activity per year isn’t nearly as dangerous as angering the voters of the State of New York, which has $1.1 trillion in economic activity per year. Consider a person living here in Louisville, Kentucky. Her state has an economy roughly the size of the Philippines, and her hometown has a bigger population than Helsinki, Finland! 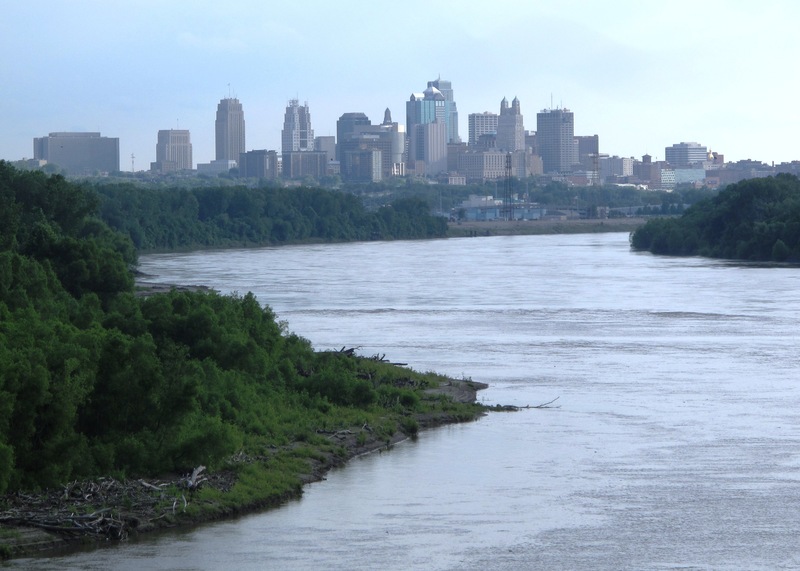 My home state of Missouri, which is relatively unimportant on a national scale, has a population of 6,022,000 people, a GDP of $229.5 billion per annum, and 69,704 square miles of land. By itself, it is nearly equal to the entire country of Denmark, which has a population of 5,590,000 people, a GDP of $314.2 billion, and 16,639 square miles of land. Then you get to personal prosperity. The median household income in the United States bounces between $50,000 and $52,000 per year. You are considered living in dire poverty if you are married, have two children, and earn less than $23,021 per year (17,060 EU, or £14,394, or 21,071 CHF). You can get all sorts of benefits for “the poor” up to 400% of this figure, meaning that you’re still considered struggling for certain things like food, housing assistance, tax credits, or other handouts up through as high an annual household income as $92,084 (or 68,240 EU, or £57,576, or 84,284 CHF) depending on a variety of factors, including the state or city in which you reside. That’s why it’s almost funny to hear non-Americans talk about how the American economic model “failed” because we have such a big gap between the rich and the poor; they don’t realize that what we call our “poor” are among the richest 1% to 2% of people on the planet. They haven’t calibrated the absurdity of how spoiled we have become as prosperity is now considered a birthright. The typical family in the United States now has a 2,000 to 3,000 square foot home, two relatively new cars, central heating and air conditioning, and a life expectancy of 78-80 years. Things that were unthinkable only a few generations ago – widespread access to spices and salt, being an everyday example – would now be cause for riots if they were taken away. We scream hysterically over the price of gas, but when you adjust it for earning power, it’s cheaper here than virtually anywhere else on the globe. [mainbodyad]Think about how many times I’ve made fun of the State of Mississippi on the blog. I do it lightheartedly, like you would tease a member of your own family, but there is some truth to my jokes; it is the biggest failure among the 50 states. It is the poorest, least educated, least healthy state in the Union. Yet, if Mississippi were a stand-alone country tomorrow, it would have a higher standard of living than most places in the world, including Russia! It would make the short list of countries under consideration if you were emigrating. If that’s failure, give it to me all day. Any system that pumps out aggregate prosperity so excessive than our destitute outrank almost everyone else alive is the one I want. Perhaps Bill Gates put it best when he said (I’m paraphrasing), “If you are born poor, it’s not your mistake. But if you die poor, it’s your mistake.” In today’s world, and today’s economy, that is absolutely true. Knowing this helps make sense of why the United States is the way it is. People in the United States rarely travel to other countries because, other than Canada (which is extraordinarily similar in almost all important respects), and Mexico, which has some significant crime problems at the moment, there are no other foreign countries around us. We own it all. The entire continent. If someone here in Kansas City wanted to go to London, a one-way trip would be 4,357 miles (7,012 kilometers). That is a greater distance that it would take someone in London to travel to New Delhi, India, which is only 4,164 miles (6,701 kilometers). If someone wanted a one-way ticket to Tokyo, Japan, it would require 6,256 miles (10,068 kilometers) of one-way travel. If I wanted to go to Disneyland tomorrow, which is right here in the United States, it’s more than 1,600 miles (2,575 kilometers) one-way! Summary: It’s bigger. The money. The food. The geographic distances. It’s all bigger. And it varies significantly from location to location and state to state. That’s why you can’t ever distill “America” into a single country. It’s not. It’s like 50 individual countries with streamlined laws and a shared cultural history. The farms of Vermont are as foreign to the beaches of California as the Arizona desert is from the water-nourished shores of the Missouri river in Kansas City. Working together, they have the authority to replace or overthrow the Federal Government that everyone associates with the United States, but is really just another part of it. The entire model is unique; a quirk of history that happened to work miraculously well. * Footnote: You sometimes see me reference the $225 trillion wealth figure for global aggregate wealth, which refers solely to individual, private, household wealth of families. These numbers from the World Bank are the whole enchilada.